In this video, Dr. Huntoon discusses Chronic Pain and what you need to consider when dealing with this uncomfortable, relentless condition. Having experienced Shingles in 2001, Dr. Huntoon has personal experience in eliminating the condition within 3 weeks. His Neurologist responded after it was eliminated that he could not have had Shingles because shingles does not go away like that. Dr. Huntoon knows the truth. When Chronic Pain has got a hold on you, we have the tools to naturally eliminate the pain in 85 % of people. Shingles, also known as herpes zoster, is a painful, blistering skin rash caused by the varicella-zoster virus, the virus that causes chickenpox. If you or a loved one suffers with this debilitating condition, please continue reading for a way to handle your shingles. The first symptom is usually pain on one side of the body, tingling, or burning. The pain and burning may be severe and is usually present before any rash appears. Next for most cases red patches will appear on the skin, followed by small blisters. The rash usually involves a narrow area from the spine around to the front of the belly area or chest. However the rash may involve face, eyes, mouth, and ears. After the blisters break, they will form small ulcers that begin to dry and form crusts in the affected area. The crusts fall off in 2 to 3 weeks and thankfully scarring is rare. You may also have pain, muscle weakness, and a rash involving different parts of your face if shingles affects the trigeminal nerve in your face. After you get chickenpox, the virus remains inactive (becomes dormant) in certain nerves in the body. Shingles occurs after the virus becomes active again in these nerves years later due to stress. The exact cause of the virus suddenly becoming active again is not clear. It is most commonly associated with a sudden severe increase in stress levels. Often only one attack of shingles occurs. If an adult or child has direct contact with the shingles rash on someone and has not had chickenpox as a child or a chickenpox vaccine, they can develop chickenpox, rather than shingles. Your doctor may prescribe a medicine that fights the virus, called an antiviral. The drug helps reduce pain and complications and shortens the course of the disease. Acyclovir, famciclovir, and valacyclovir may be used. The medications should be started within 24 hours of feeling pain or burning, and preferably before the blisters appear. The drugs are usually given in pill form, in doses many times greater than those recommended for herpes simplex or genital herpes. Some people may need to receive the medicine through a vein (by IV). Strong anti-inflammatory medicines called corticosteroids, such as prednisone, may be used to reduce swelling and the risk of continued pain. These drugs do not work in all patients. Zostrix, a cream containing capsaicin (an extract of pepper) that may reduce the risk of postherpetic neuralgia. As with all medication, certain side-effects are known and others are not known. It is important to consider the side-effects and do some research into the medication being prescribed to determine if the side-effects are worse than the symptoms associated with your shingles. Cool wet compresses can be used to reduce pain. Soothing baths and lotions, such as colloidal oatmeal bath, starch baths, or calamine lotion, may help to relieve itching and discomfort. Resting in bed until the fever goes down is recommended. The skin should be kept clean, and contaminated items should not be reused. Non-disposable items should be washed in boiling water or otherwise disinfected before reuse. The person may need to be isolated while lesions are oozing to prevent infecting other people who have never had chickenpox -- especially pregnant women. Herpes zoster usually clears in 2 to 3 weeks and rarely recurs. If the virus affects the nerves that control movement (the motor nerves), you may have temporary or permanent weakness or paralysis. Sometimes, the pain in the area where the shingles occurred may last for months or years. This pain is called postherpetic neuralgia. It occurs when the nerves have been damaged after an outbreak of shingles. Pain ranges from mild to very severe pain. It is more likely to occur in people over 60 years. Dr. Huntoon has personal experience with this painful condition. His affected the right side of his face causing paralysis and impacting his sight. After consulting with his Neurologist, he was unhappy with the "antivirals" being offered and developed a true solution for the problem. Using ALL of his knowledge and training from Advanced Healing Techniques he had been exposed to and practices, he developed a Unique 3 Step Solution. 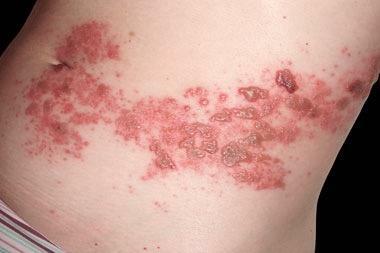 Once instituting the solution, his shingles cleared up within 3 weeks and has never come back. His Neurologist, once he saw the results of the treatment, said it could not have been the shingles because shingles does not clear up that way. Even though the Neurologist did blood work to confirm the diagnosis, he was not convinced when he saw the treatment results using no medication. Working with a Holistic Chiropractor, there are techniques that will help address the virus and by strengthening the Immune System and Nervous System with Whole Food Supplementation, the body can regain its balance and become virus free. There is a new, ground-breaking technique called Neurologic Relief Centers Technique (NRCT) which addresses a common underlying complication of Shingles known as Meningeal Compression. This technique is currently only available through Certified Practitioners who have been trained in NRCT and who are listed on the NRCT Website at www.nrc.md Please go to this website and review the information and videos and locate a practitioner near you to help you see if this revolutionary technique can be the solution to your Shingles. In successful cases of NRCT treatment, the lingering effects of shingles have been lessened, if not fully handled once and for all. Your doctor can make the diagnosis by looking at your skin and asking questions about your medical history. Tests are rarely needed, but may include taking a skin sample to see if the skin is infected with the virus that causes shingles. Blood tests may show an increase in white blood cells and antibodies to the chickenpox virus but cannot confirm that the rash is due to shingles. Call your healthcare provider if you have symptoms of shingles, particularly if you have a weakened immune system or if your symptoms persist or worsen. Shingles that affects the eye may lead to permanent blindness if you do not receive emergency medical care. Avoid touching the rash and blisters of persons with shingles or chickenpox if you have never had chickenpox or the chickenpox vaccine. Developing a healthy lifestyle with proper guidance from your Holistic Chiropractor is the best prevention when considering how to approach your health. Using Holistic methods associated with your visits to a Holistic Chiropractor will help to prevent the virus from affecting you.